Fossils are pretty amazing. The imprints of plants and animals that lived hundreds of years ago are preserved through fossils and help scientists today understand more about the living beings of long ago. 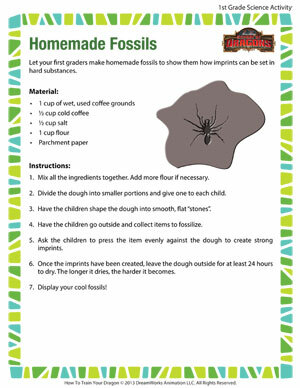 Let your first graders have fun making their own fossils by following the instructions in this printable science activity. While it isn’t quite the same as fossilization, it is a great way to help little kids see how imprints can be formed in hard substances.